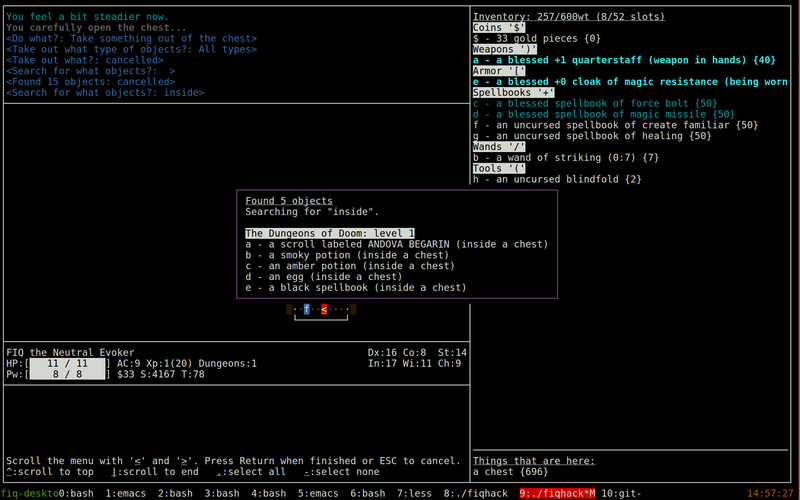 A NetHack variant based on NetHack4 that focuses on AI balance and interface improvements. Tips on how to play! Since NetHack4 is based off NetHack 3.4.3 (via NitroHack + AceHack), consider 3.4.3 as the "baseline" rather than 3.6.0. Energy regeneration greatly boosted earlygame. EoTA users, however, should expect generally slightly less energy. Energy is now based on wisdom and experience level only, with Wizards getting a boost, and people with energy regeneration (EoTA) getting a bigger one. Slowness can be given from being in the view of a floating eye, being hit by the slow monster wand or spell. Makes you half as fast as without it. Can only be "cured" by waiting it out. Being canceled is permanent until cured. Cancellation prevents you from making any use of your Pw/energy. Also prevents a majority of special attacks similar to monsters (only relevant for polyself). Can also be cured by quaffing a noncursed potion of gain energy, reading a scroll of charging while confused or stepping onto a magic trap and getting the "You are caught in a magical explosion!" effect (which is far more common than usual if canceled). Monster intrinsic/extrinsic system now works like players (in fact, players now use the new monster intrinsic system too). This means that monster has a lot of new intrinsics/extrinsics to play around with. This also means that illness, sliming, strangulation and petrification are gradual processes for monsters now. Eating corpses/jewelry confer new intrinsics (but only pets eat corpses at present). The mines brightness is now consistent. Upper mines are always bright, lower mines are always dark. Magic missile now does less damage at lower skills than Expert. However, they can now disrupt reflection at Skilled and semi-bypass MR (so MR only halves damage) at Expert. The Magic Mirror of Merlin's double damage will not apply to other Knights (including yourself), to compensate. Watch out for lategame magic missile users! Shimmering dragons exist, as do their scales, which grant displacement. Potions/scrolls/books/wands are no longer destroyed if you have the applicable extrinsic. Only having it extrinsically protects against it, not intrinsically. You can throw items (any item except for ammo from an appropriate launcher) to intelligent non-paralyzed pets to force them to pick it up (by catching it). Wands of create monster was decreased from 11-15 charges to 4-8. In addition, instead of summoning 1/2/3/4/5+d7 (with a 1/23 chance of summoning +d7 on lower levels too), it now summons 1/d2/d4/d8/d16 with no additional monsters. Buffed Tsurugi of Muramasa -- now does double damage (instead of +1d8) and can be invoked to uncurse itself. Changed scroll writing for unknown scrolls and spells: Instead of being Luck dependant, you now have a XL/50 chance of success. Priests get a +20 bonus to effective XL when calculating their chance, so at XL30 they can always write unknown scrolls. A new command, 'castalias' was added, allowing you to alias keys to spells by mapping keys to it (Options -> interface -> keymap) and invoking it. This allows you to alias more than a single spell to keys. Hunger from ring of regeneration only applies when you aren't at maximum HP. You can now get into the Quest at XL10 instead of XL14. In addition to this, it also gives you permanent knowledge of your role's "special spell". Since this would make the crowning gift a monk gets redundant, they now get a magic marker. Life saving will not apply if the player is nonliving. As a result, this means that you can only cast "confuse self" from T:60001 and onwards assuming you got the spell at T:1. This was anticipated, but not considered a problem. Since spellbooks now lack charges, this means you can polypile books indefinitely and relearn/learn spells from them. However, the book will disappear when you successfully (re)learn a spell, as usual. Cleaver now hits in an arc, hitting monsters at left and right of your main target. Blessed scrolls of teleportation will now, instead of prompting for if you want to teleport, allow you to perform a controlled teleporation whether you have teleport control or not. Added monster lookup. Either specify a monster with '/', or use ':' instead of '.' when farlooking with ';' for info. Alignment penalties no longer set you to 0, then decrease -- instead, max alignment record decreases down to a minimum of 20. You can displace peacefuls. Monsters can, too; tame, hostile or other peacefuls. Altars are colored based on alignment. Lawful is white, neutral gray, chaotic black (or blue in !use_darkgray). Unaligned altars are red, "aligned altars" (Astral) are yellow. Being slow will now block all forms of intrinsic and extrinsic speed while going on. Item destruction is rarer: 50% if cursed, 25% if uncursed, 6.25% is blessed. Wands lose charges instead of being destroyed, unless it's emptied, or was already empty/cancelled. Lamps, candles, whatever, now has their light radius depend on BUC. Slow monster can be resisted 66% with free action, and 100% with blue dragon scale (mail). Quaffing blessed potions of speed will also make it go away. The Amulet now gives slotless aggravate monster. The spellbook of haste self is now the spellbook of speed monster. It works basically the same except that it can now be used on others. Added "true" female monster names: gnome ladies, Elvenqueens, etc. Pressing > or < when not at a stair will prompt for travelling to the corresponding map symbol without the need to invoke _ first. Make it possible to, if your outermost armor is greased or is an oilskin cloak (or has the oilskin property), squeeze through tight diagonal spaces with twice as much inventory as normal. Using 'f'ire while wielding a polearm with an empty quiver will, if possible, use the polearm. Give remembered item amount in a container. Similar to 3.6.0, but will not change if container content changes outside your watch. The guranteed marker for Tourists is now 0:0. Spellbook level now depends on weight: 30 for blank paper, 35 for level 1 books, 40 for level 2, 45 for level 3... in steps of 5. Fire immunity will shield you from lava. Poison deals half damage when it does damage, and reduces attributes (including permanently) only a third of the time. Attribute loss is also reduced to a third. Sleep resistance will only make you sleep for a third of the time, and taking any damage will wake you up. Amulets of restful sleep now confer sleep resistance (but not sleep immunity). Rings of resistance has been renamed to rings of immunity to reflect this change. For example, the ring of fire resistance is now the ring of fire immunity. msgfading can be specified as fade (default, darkens colors), blank (blanks the message line completely) or don't change (don't change old messages in any way). For those who want to mimic NAO unix tty windowport: set msgfading to blank, msgcolor to gray. Quest nemeses no longer respect Elbereth (or scare monster). Strength works differently: it now works like an ordinary attribute rather than being special past 18. Elves keep their 18 strength cap, gnomes reach 19, orcs 20, humans and dwarves 21. Oilskin sacks no longer generate (because the oilskin object property exists). Saddles are now twice as common. Artifact lances (Dragonbane) now comes with a free saddle and riding unrestriction included, entirely free of charge. The "autounlock" option now works on chests, prompting for unlocking them directly from #loot if locked. Monsters are now able to jump. When considering what equipment to wear, pets will prefer items thrown at it over anything else, the more recently thrown the better. Alchemy smocks (aprons) are now MC3 instead of MC1. Energy regen tweaked slightly: 0.02*Wis instead of 0.03*Wis and 0.04*XL instead of 0.03*XL. Player monsters outside Astral has a slightly better inventory (and an astral-like inventory if generated in Gehennom), and now are skipped in random generation with a 90% frequency instead of a 99% one (making them basically not generate ever). Water elementals now engulf you and can drown you. This uses a suffocation timer of (2Con+1)/3 turns, so with 18 Con, it takes 12 turns until you drown. Piety is a scale on how much your god likes you. Added magic chests. They are objects, but generally behave like dungeon features -- they can't be picked up, teleported, polymorphed, or similar. They can, however, be wished for, which creates one on your location. There are chests in Minetown, Sokoban, Castle and Orcus. As part of this change, Fake Wizard's Towers has been removed. They can spawn as ordinary special rooms, however, but will never have a portal. Instead, you enter the Wizard's Tower from the bottom floor. Ported 3.6.x Sokoban completion mechanics -- now tells in #overview (^O) if you've solved it or not, and Sokoban special cases stop applying once you solve a puzzle. Added message_hints option, which explains various more vague messages printed by the game. This page was last edited on 10 April 2019, at 15:24.